Bhindi Do Pyaza or Dopiaza in persian means two onions. 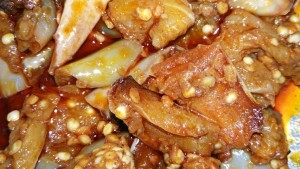 Onion is added both while cooking and even garnishing. 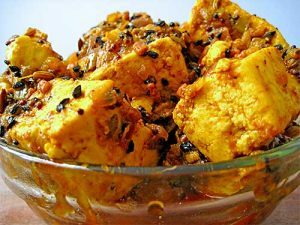 Dopiaza this can be prepared with Meat, Paneer or mushroom or for the sake any other vegetables. My first stint with Do Pyaza recipe is during my college days in Roorkee. During those days when we get bored with our mess food, like majority of the students we flock to Vaishno Dhaba which is situated on the Delhi Haridwar Highway. The best part of the Dhaba is that they turn fully in to vegetarian during the festival seasons. The Do Pyaza dish is having a generous amount of nicely saute onions in a variety of spices. The nice taste of the onion gives an extra punch for the dish which one needs to taste at least once. Earlier I use to wonder the how the name Dopyaza came from. Legend of Do pyaza recipe is that a courtier of emperor Akbar, Mullah Do Piaza added large quantity of onion accidentally and the dish turned out to be tasty.This dish is believed to be evolved in Hyderabad and later spread to other parts of India mainly in restaurants. 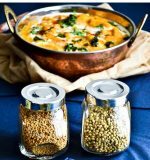 In most cases in this dishes, an additional sour ingredient is added and we have added Amchur or Dry mango powder. 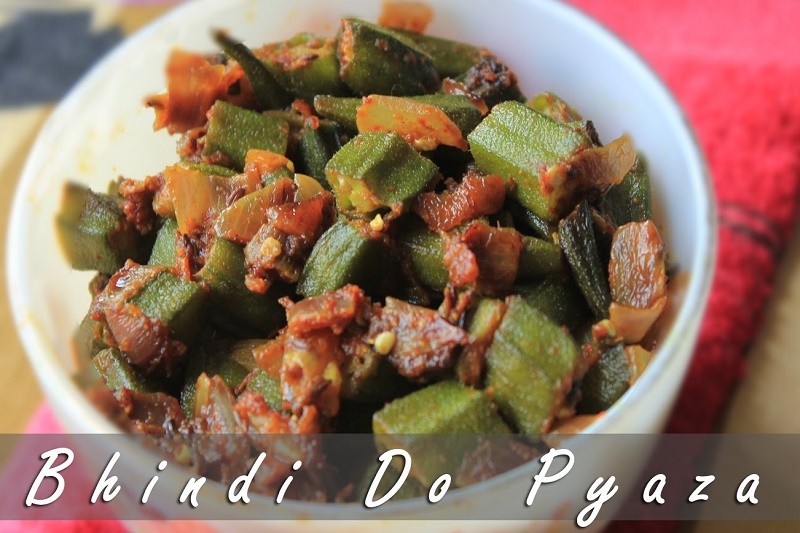 Bhindi Do pyaza recipe made of Bhindi or okra or ladies finger with almost double the amount of onion in it. 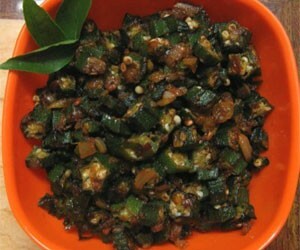 MostlyBhindi Do Pyaza is a North Indian dish adapted from South India which is a dry side dish and very tasty. Wash the bhindi in clean water and make them dry. Then cut them into pieces of about 1 inch long. Heat the oil in a pan and put the bhindi. on a medium flame stir continuously. Now take out bhindi in another container. Heat the remaining oil in the same pan. Add cumin in it and fry. Now add ginger and fry for some seconds. Now add onions in it. Stir fry onions till it becomes slightly golden. Add chopped tomatoes and fry for 2-3 minutes. Now add all dry ingredients and salt except dry mango powder. Stir for some time. After that add bhindi in it and mix well. Now add dry mango powder in it and stir fry for some time. 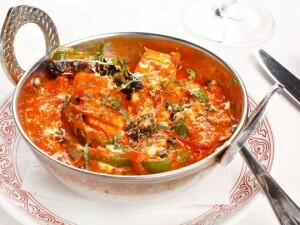 Switch off the flame and take out the bhindi on serving plate. Decorate it with coriander leaves. Your bhindi do pyaza is ready now. Dry the bhindi properly after washing to avoid Bhindi . If the bhindi is wet , subzi will turn slimy . 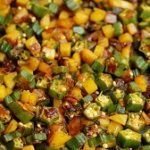 If you have time , after chopping the bhindi , its better to keep in fridge for about 1-2 hours . This will help in reducing sliminess more. Fry the subzi nicely on medium heat. Don't add salt initially . Add it mid . If you want , initially only while roasting bhindis ; add amchoor powder . Addition of tanginess reduces sliminess Don't cut oil quantity . Bhindi typically reuires oil to get a nice crispiness . In restuarants , they deep fry bhindis while making this dish . If you find the bhindi and onion is sticking to the kadai , add some more oil . 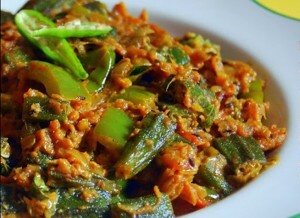 Tender fresh bhindi taste best for this dish .